12 different varieties of culinary herb seeds; includes Basil, Chives, Cilantro, Dill, Marjoram, Oregano, Parsley, Rosemary, Sage, Savory, Spearmint, and Thyme. Herbs grown in my Organic Mediaeval style Garden, in raised beds and containers, adds diversity to my garden and flavour to food on the table. 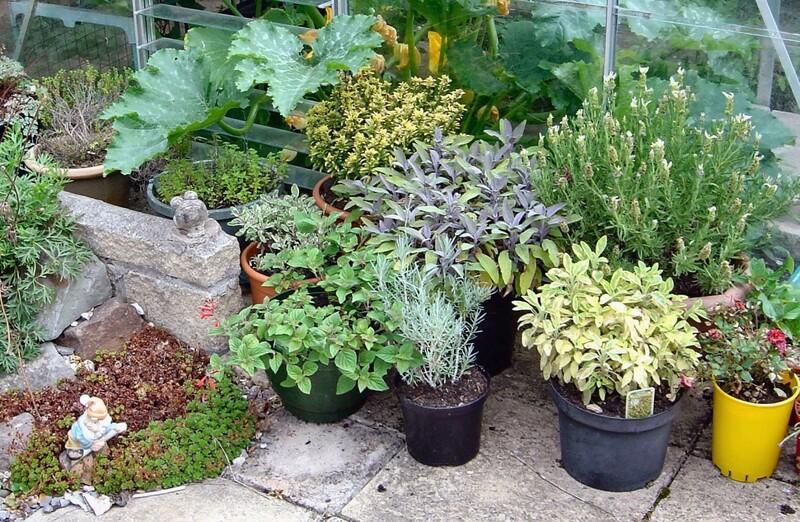 If you wish to have a go at growing your own herbs but don’t know which herbs you want to grow, or you want a selection to get your herb garden started, then these variety packs shown here are just the ticket to get you started. 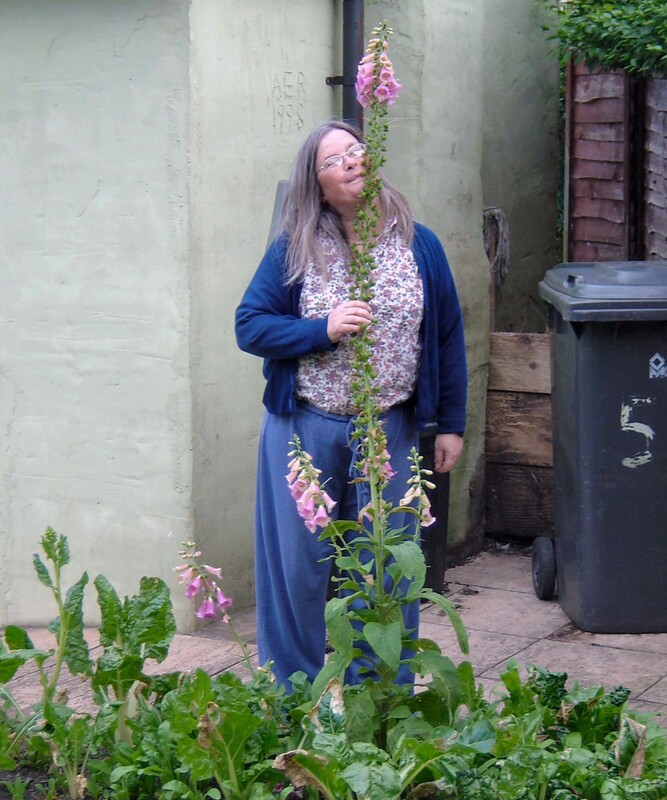 In this article I Feature a number of flowers and weeds not normally associated with herbs e.g. pot marigold, dandelion and nettle, and Herbs for the kitchen such as Mint (black peppermint, lemon mint, Apple mint and Indian mint (Satureja), Sage Icterina, Parsley, Bronze Fennel, French Marjoram, Feverfew, Laurus Nobilis (Bay Tree), Lemon Balm, Rosmarinus (trailing form of Rosemary), Doone Valley Thyme and Thyme Silver Posie. 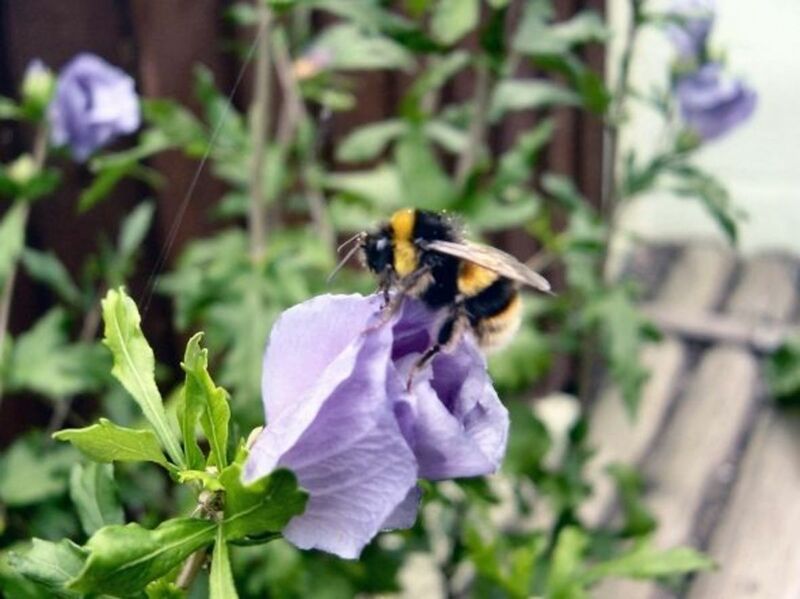 The growing and use of herbs for aromatic, culinary and medicinal use is a big topic to cover, so in this article I feature the herbs I grow in my garden with a brief overview of each one as a taster of just some of the benefits you could reap by growing your own herbs in your own back garden. Some herbs are known to react with medication so please seek proper medical advice before using any herb for medicinal purposes. 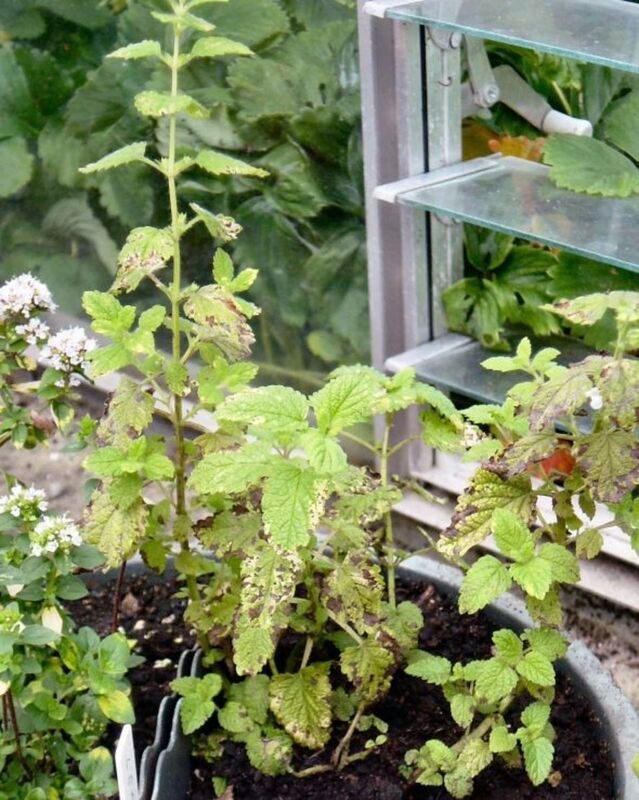 Some herbs such as mint can run away with you in your garden and should be confined to their own corner of the garden; mint in particular can spread rapidly through their root system, other herbs like Fennel propagate vigorously through seeds. 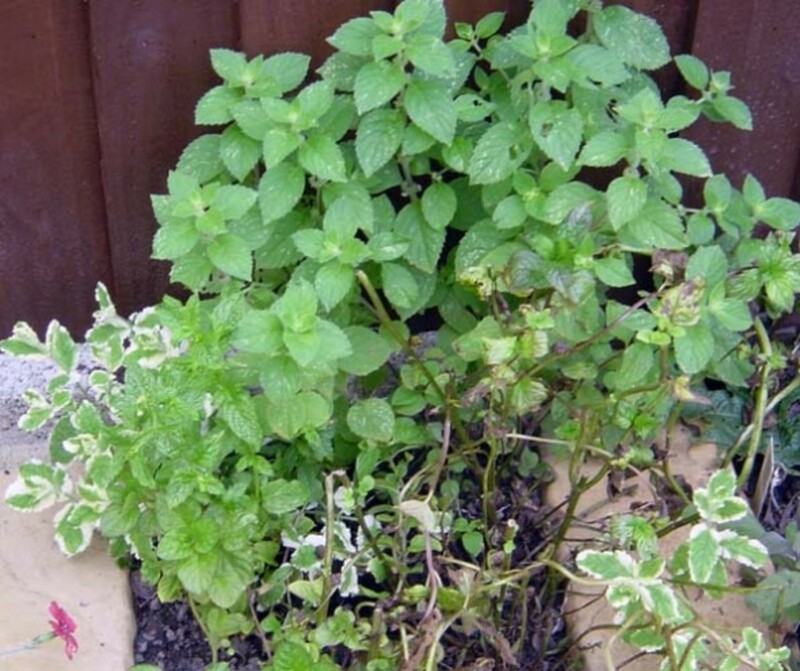 Also herbs for use in the kitchen want to be to hand; you don’t want to go wading through a muddy garden at a moment’s notice just to pick a sprig of mint to flavour your boiled or mashed potatoes; you want them to hand and in easy reach. 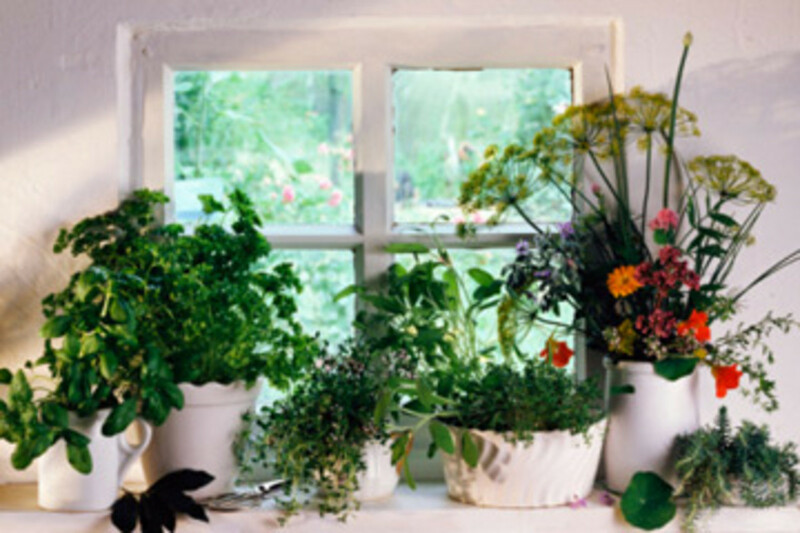 An ideal place for these herbs is just outside the back door or in a herb garden near the house. Some of our herbs are in containers on the patio near the house, others which I can pick in advance (often just before I plan to cook so they are still fresh) are in their own pots, containers or raised bed at the end of the garden; some take pride of place in their own herb wheel. Other herbs, such as sunflowers and marigolds and native wildflowers like Borage, I grow straight in the ground with the vegetables as part of companion planting in my medieval vegetable garden. 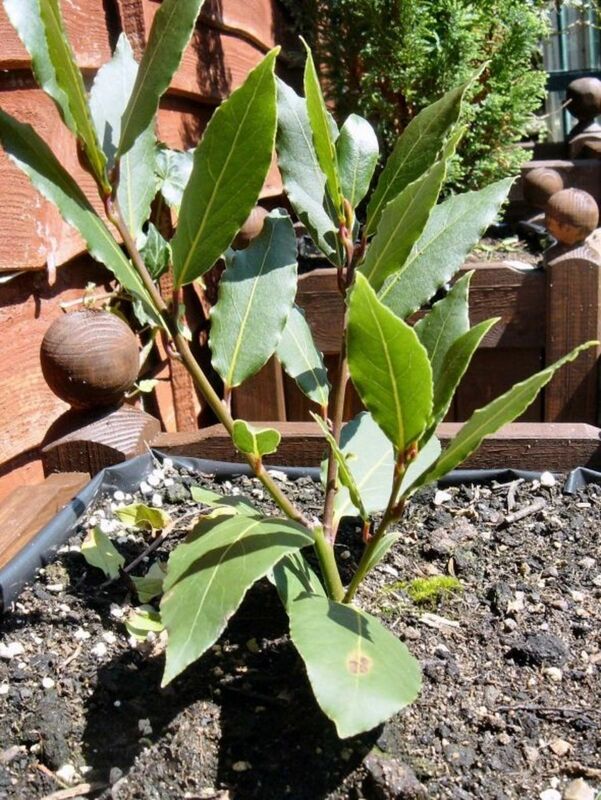 The Bay tree is an evergreen shrub or small tree with large aromatic dark-green glossy leaves. 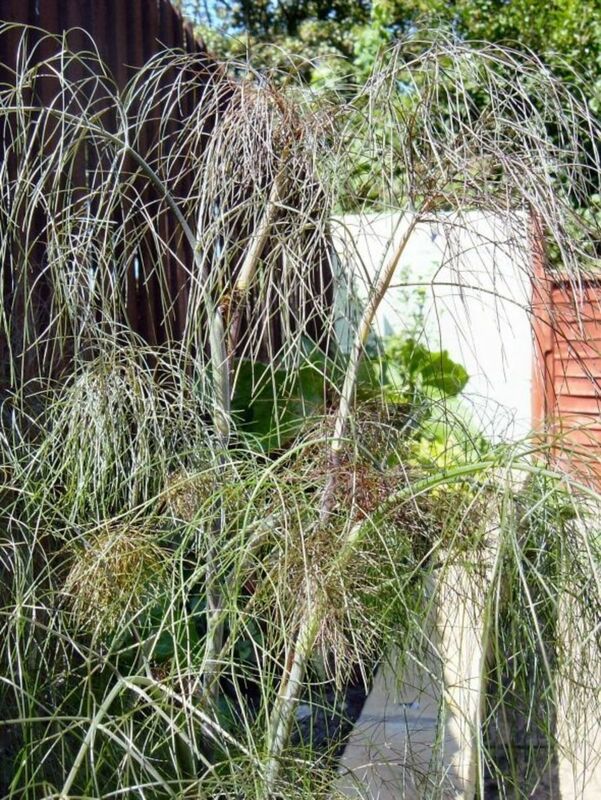 To restrict its growth (unless you wish to end up with a tall tree in your garden) its roots are best contained by planting in a suitable sized pot. Pick fresh leaves, rinse and add to sauces, soups and other dishes. Bay leaves are traditionally used in dishes requiring long cooking times so that the flavour from the leaves can diffuse into the dish, and the leaves are then removed before serving. Commonly used in European recipes especially in the Mediterranean and in North America for soups, stews, meat, seafood and vegetable dishes, and in Indian cuisine. The leaves are also used to flavour classic French dishes such as bouillabaisse and bouillon. The leaves are generally used whole and removed before serving, but dried leaves can be crushed or ground before cooking to impart more of their desired taste. Does well in full sun, water sparingly in winter and never allow it to dry out. 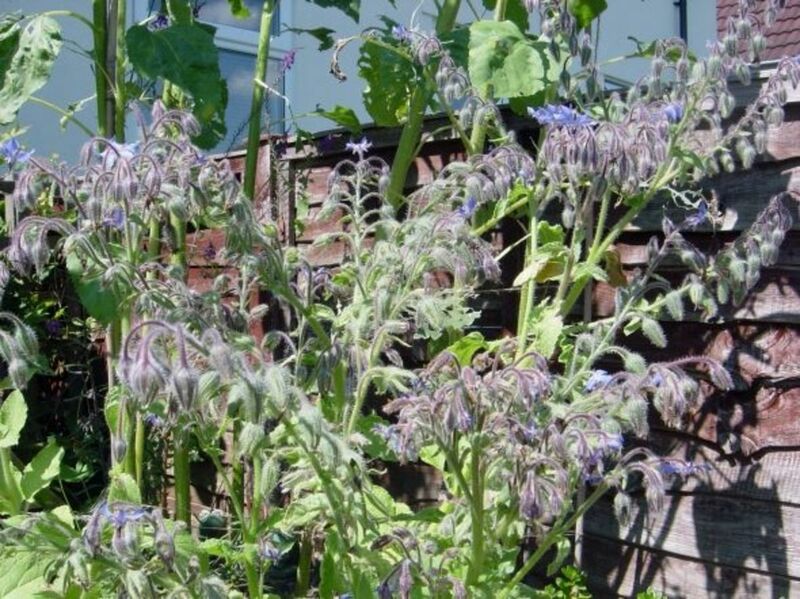 The Borage also known the starflower is a hardy annual herb with bright blue flowers loved by bees. 1ft to 3ft (30cm to 1m) tall and a spread of up to 1ft (30cm). This attractive plant is equally suitable for the flower border or herb garden. Fresh flowers are used to decorate salads and iced drinks, crystallised for cake decorations. Pull on the centre of the flower and it easily comes away from the seed pod. The leaves have a cucumber flavour. This is one herb we didn’t buy from the garden centre, it appeared in our front garden one year and once identified we started using its flowers as edible decoration in our salads. The following year it migrated to the vegetable garden in our back garden where it has stayed ever since, popping up most years amongst the vegetables as companion plating which ideally suits my style of Medieval Vegetable Gardening so is most welcomed and encouraged in our garden. It’s not invasive, just a few plants pop up in one spot where it quietly sits and meditates while I garden around it, just pick the odd flowers here and there when we have salad. Water well until established. For potpourri pick flowers for drying in fine weather. The Common Garden Dandelion is considered by most gardeners as a nuisance weed, it grows just about anywhere with no encouragement, spreads fast and far with its seeds that drift in the wind and it is difficult to get rid of with its long taproot, up to 1ft (30 cm), which unless you dig up the whole root will regrow. However, since before mediaeval times the Dandelion has been known for its medicinal properties (contains luteolin, an antioxidant) and culinary uses. Young leaves can be added to salads (often blanched first to reduce the bitterness). 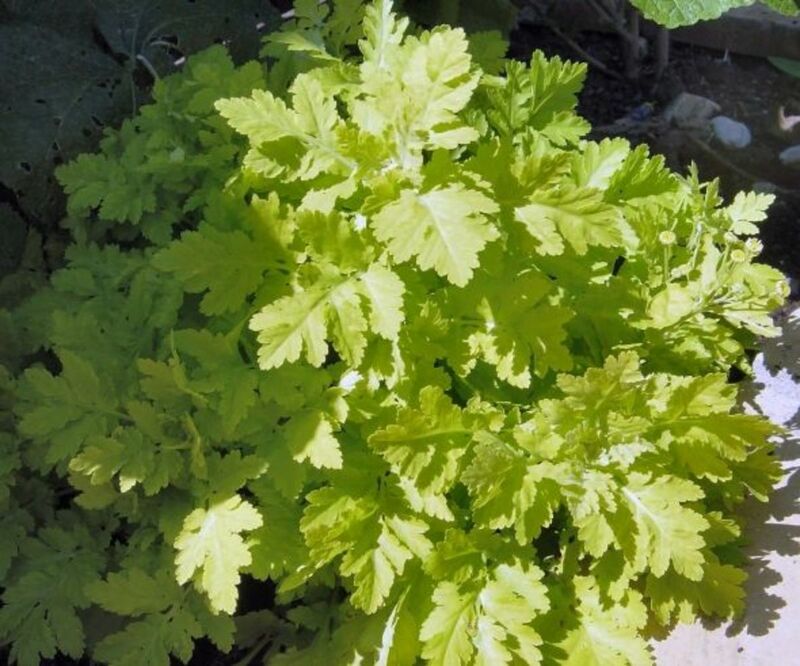 Leaves (young or older) can be made into a refreshing drink by soaking in boil water for several minutes and draining-off; the same as with Feverfew and Herbal Teas described below. The roots can be boiled as a vegetable, or roasted and ground up to make a caffeine-free coffee substitute. 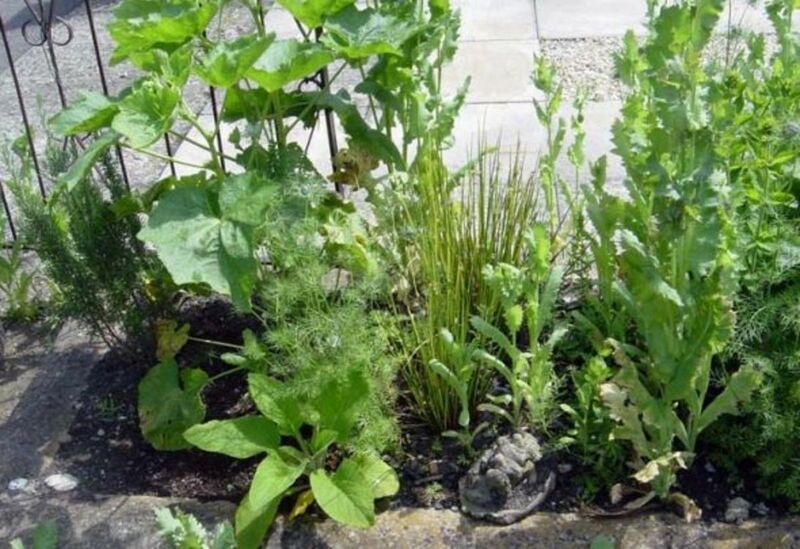 The Fennel with feathery foliage (leaves pinnate with thread like leaflets) growing up to 2 m (6 ft) tall is a very graceful plant that adds colour to any herb garden or perennial border. Leaves, fresh or dried, are used in fish dishes and the seeds may be used in soups, bread or cakes. Leaves and thick stems can also be used in the same way as celery, and the flowers of the Bronze Fennel can be added to Salads. The Bronze Fennel propagates by dropping its seeds, and is a prolific propagator so you’ll want to keep it away from areas of the garden where you don’t want to be constantly pricking its seedlings out the next year. Planting or sowing this herb amongst shorter shrubs where its foliage can stick above them might complement these shrubs, and where it can get some shade from the sun may be ideal for it rather than in a middle of other more delicate herbs or in the vegetable plot. 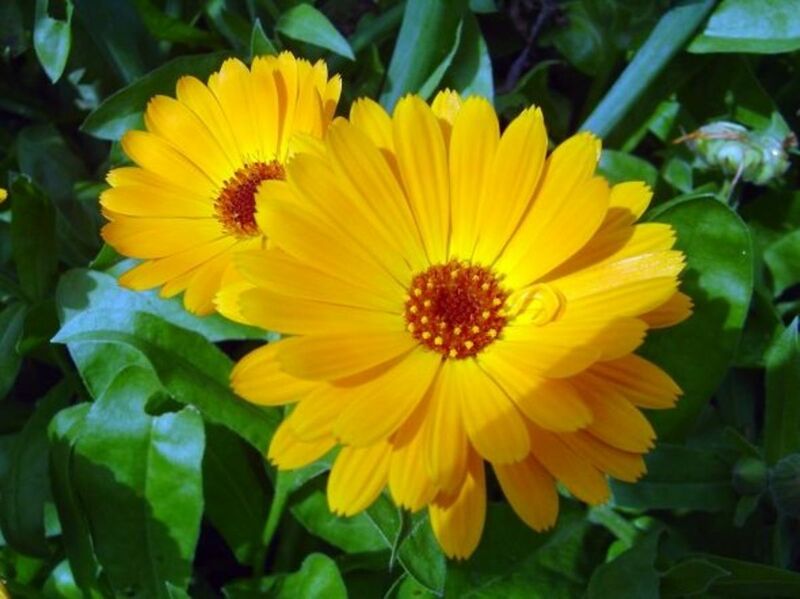 Plant in well-drained soil in a sheltered sunny position and water well until established. The medicinal properties of Feverfew have been known for thousands of years. Feverfew is purported to help lower fevers and ease headaches and is therefore considered an ideal natural remedy for colds and flu. Although not a cure it is meant to help to ease the discomforts, but it should not be taken in excess or if pregnant and eating fresh leaves can cause mouth ulcers. An easy way to prepare feverfew as a drink to ease a headache or the symptoms of a cold is to pour boiling water onto a few leaves and leave to soak for 15 minutes before drinking. Feverfew is bitter so adding honey to sweeten the drink has been a common practice since before medieval times. Pictured is Golden Feverfew, which may not have the medicinal properties of the species? An easy to grow perennial bearing small white daisy flowers in summer with a strongly aromatic foliage and a bright golden hue for most of the year. Position the plant in well-drained soil in full sun and water well until established, and remove faded flowers to prevent self-seeding. 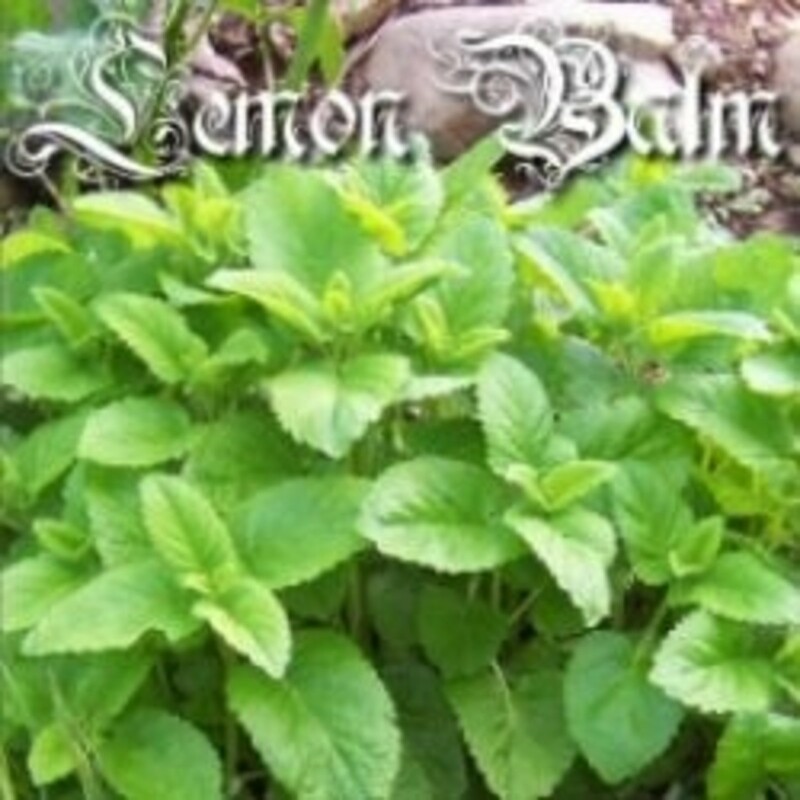 Lemon Balm is a bushy vigorous growing perennial herb in the mint family Lamiaceae. 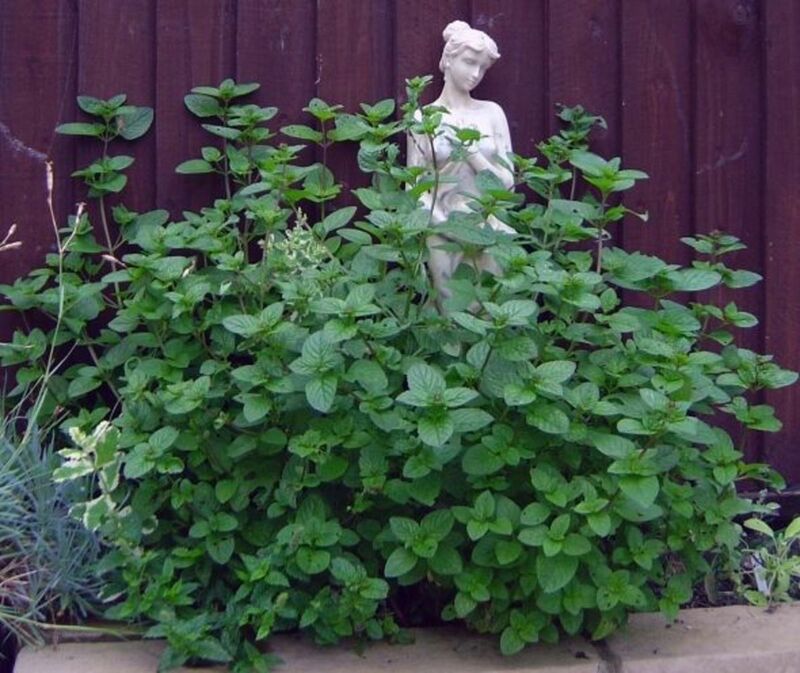 Like other mints it can be invasive in gardens and therefore should be well contained. Lemon Balm growing from 1 ft. to about 2.5 ft. (30 cm - 75 cm) is native to southern Europe and the Mediterranean region. Its leaves, strong lemon-scented, are toothed ovate and rough textured. Fresh leaves add lemon flavour to a wide variety of hot and cold dishes and drinks e.g. salads, soups, sauces, deserts, soft drinks and liqueurs etc. 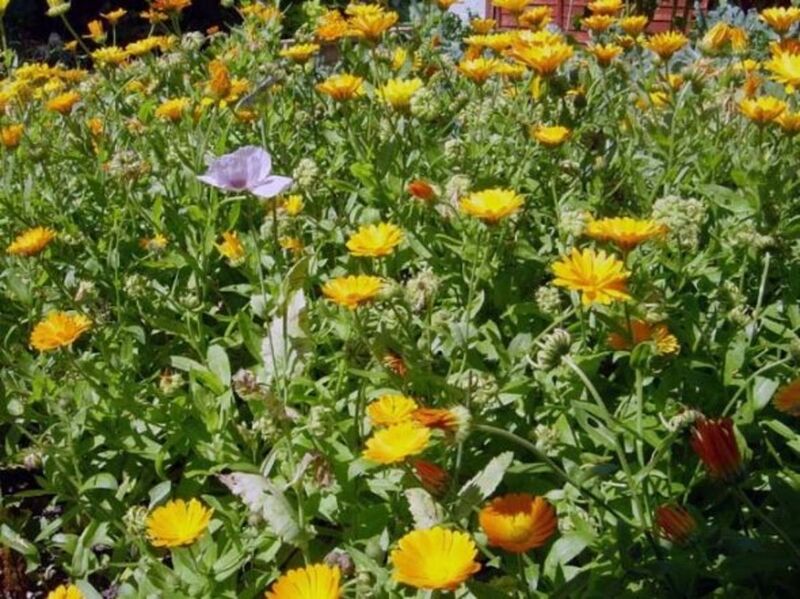 Pot Marigolds are traditionally known for their companion properties in the vegetable garden due to the aromatic oils they contain acting as an excellent insect-repellent which discourages whitefly. 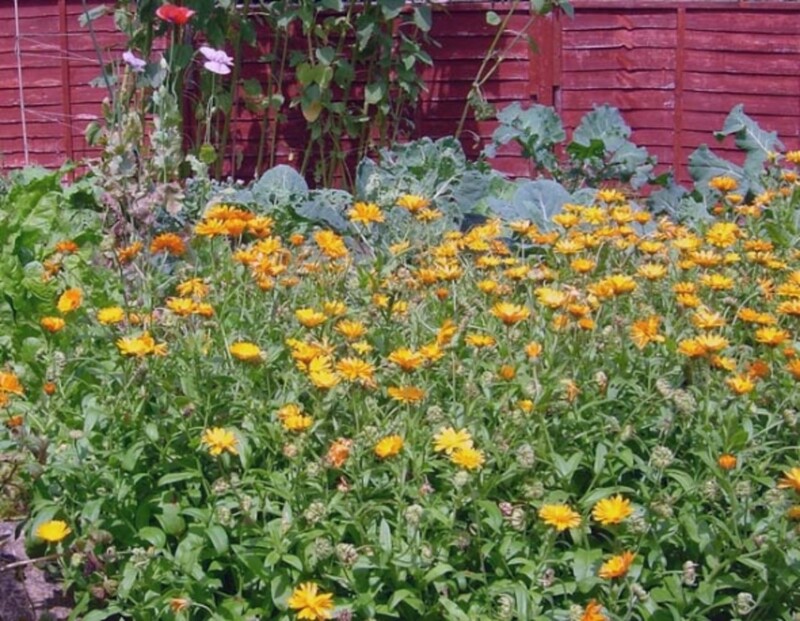 However, although most marigolds are not edible the petals of the English Pot Marigold (pictured above) are edible and if picked fresh makes an excellent decoration to any salad. 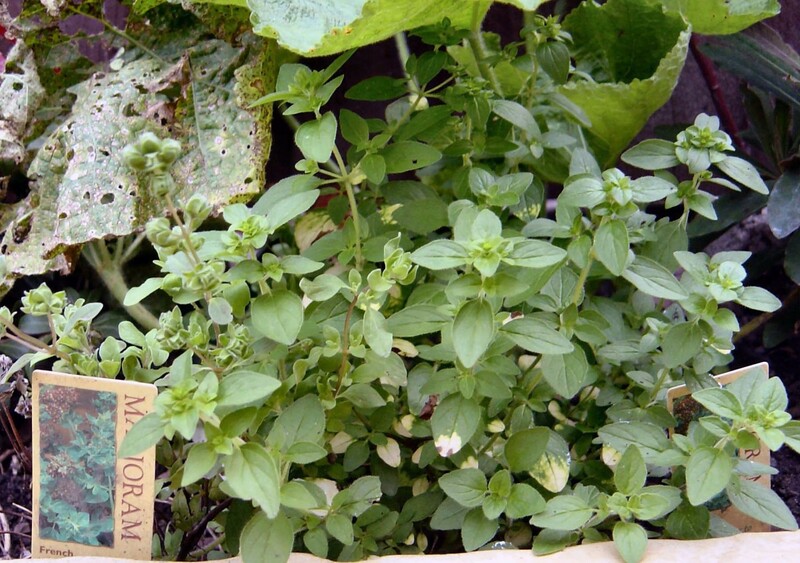 Most Marjoram's are hardy perennials growing up to 2 ft (60 cm) high with a similar spread. Leaves and stems can be used to flavour a wide variety of dishes including Mediterranean and vegetable dishes. Caution, Marjoram should not be given to pregnant women in medicinal doses due to its uterine stimulants. 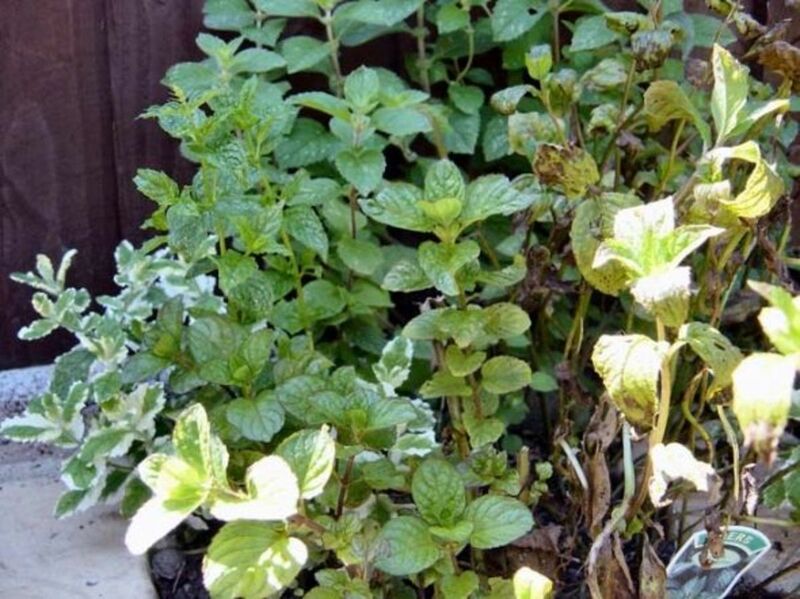 Mint is the Spice of Life in Cooking, and they come in many flavours from the strong tasting and vigorous growing mints such as peppermint and spearmint to the milder and less vigorous (variegated) plants like lemon mint and apple mint. They all have one thing in common; their roots are invasive so if they are not contained they will quickly spread to other parts of the garden where they are not wanted. Add a few leaves of mint to the saucepan when boiling potatoes. 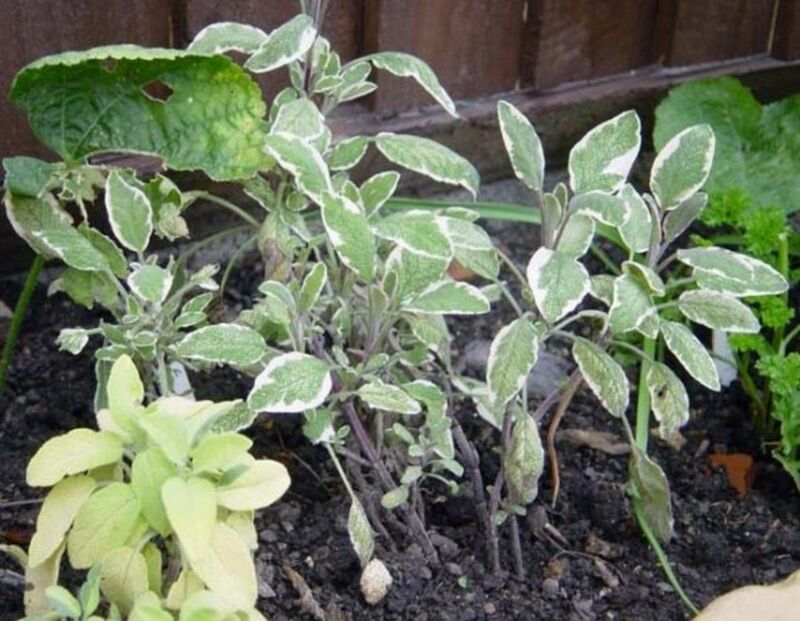 Black Peppermint can also be used to add flavour to sweets, cakes, summer drinks and used to make tea. Lemon Mint can be used for refreshing teas and vinegars, and may be added to fruit salads, summer drinks and jellies. 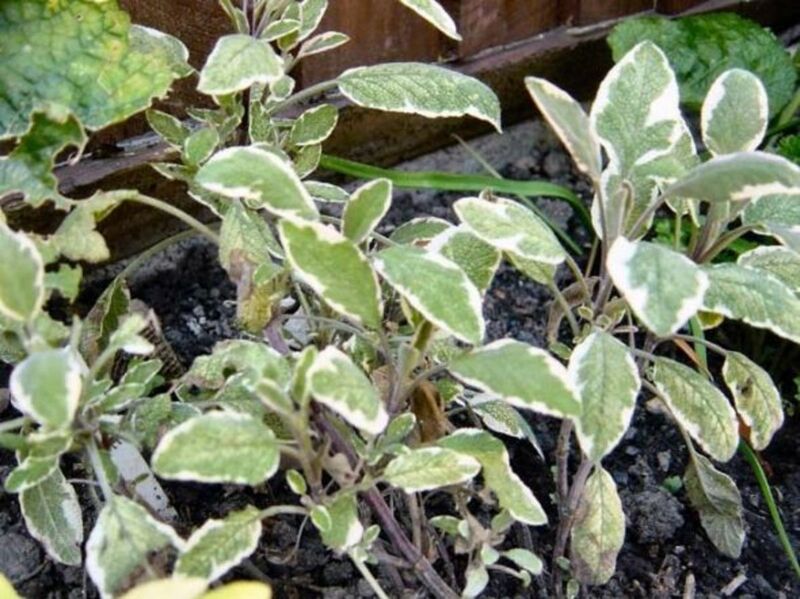 Mints if they establish can be invasive (especially the more vigorous non variegated varieties) they spread by their root system so it's always a good practice to grow them in containers to prevent any unwanted spread. 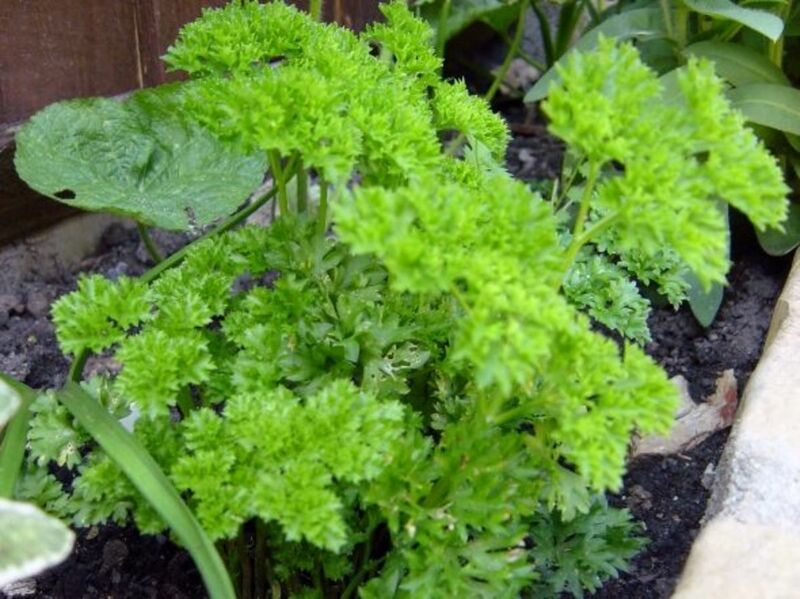 Although Parsley is a biennial because the leaves become coarsen in the second year this plant is usually grown as an annual. Salad dressing and as garnish in many cold and cooked dishes e.g. sprinkle a few sprigs of parsley on almost any prepared dish just before serving. Rosmarinus, native to the Mediterranean regions, is a small woody perennial herb with fragrant evergreen needle-like leaves. 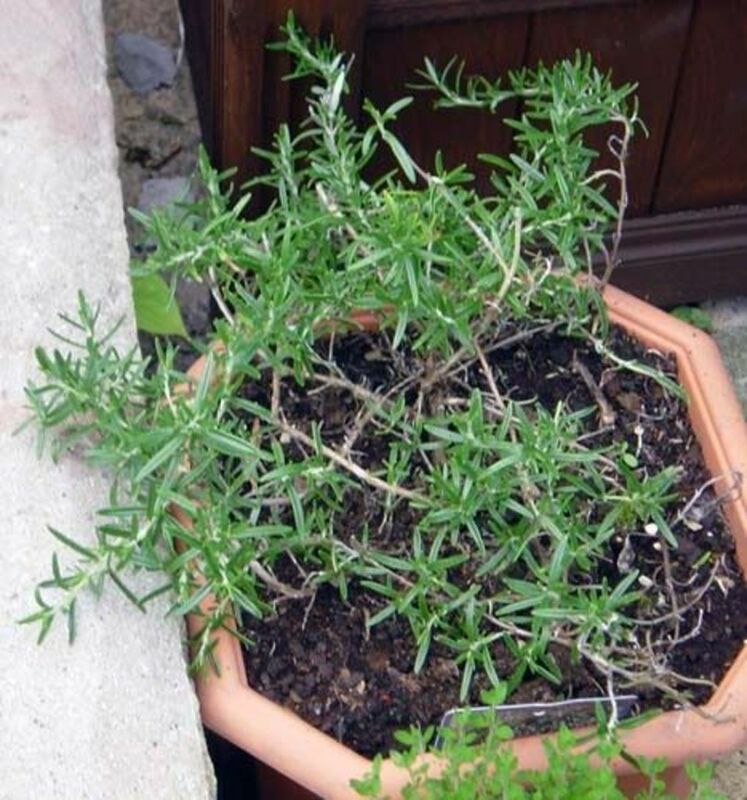 Rosemary has many medicinal properties including use as an anti-depressive. However, using such herbs for medicinal purposes should be done so only after seeking medical advice from your doctor. Rosemary in a flower pot. Rosmarinus Officinalis (Miss Jessopp's Upright) with Alcea Rosea (Hollyhock) and poppies in the front garden. The Sage (great for flavouring food) is an evergreen shrubby perennial comes in many varieties, with a height of 2 ft (60 cm) and spread of up to 3 ft (90 cm). It makes an attractive addition to any garden border, patio container, flower bed or herb garden. 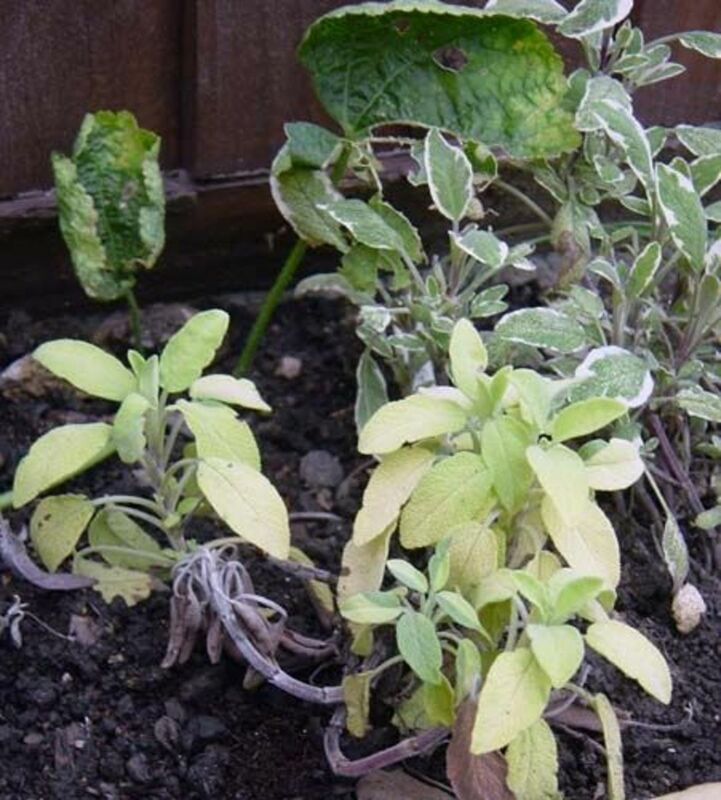 The picture below shows three varieties of Sage including Sage Icterina and Purple Sage. Leaves are used for flavouring in stuffing and many other dishes such as cheese recipes and fatty meat dishes like sausages and pork etc. The Sage Icterina (Salvia Officinalis Icterina) needs a warm and sunny site in well-drained soil. 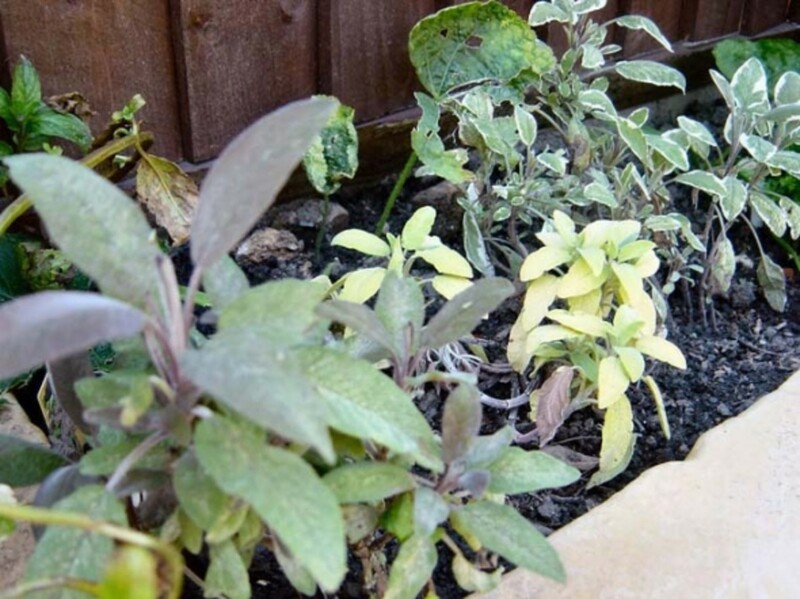 The Purple Sage will thrive in any well drained soil but prefers a sunny sheltered position. 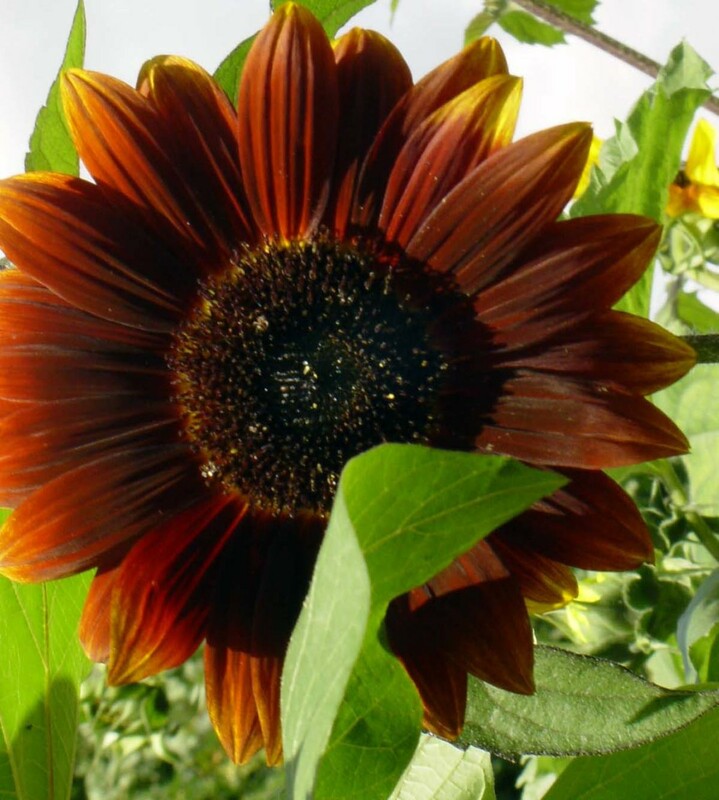 The Sunflower is an annual that can grow to 10 ft (3M) with very large flower heads (often the size of dinner plates). 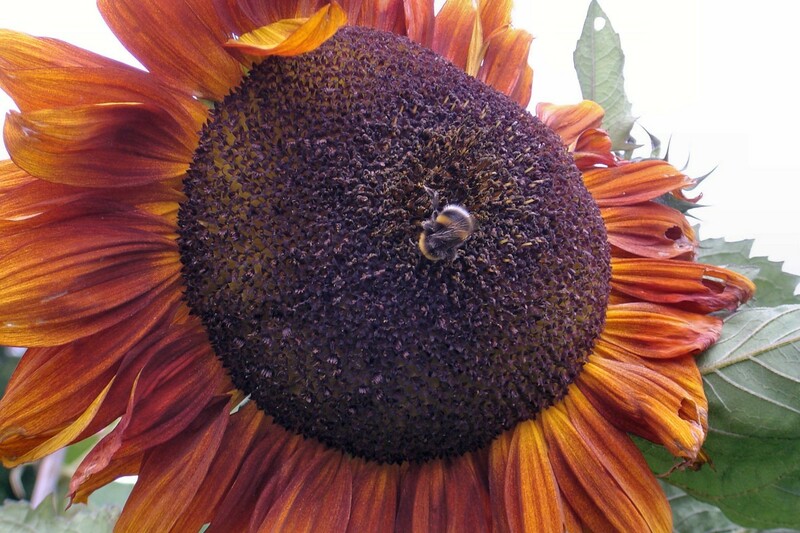 As well as an attractive feature in the garden that attracts bees the sunflower is popular the world over for its edible seeds for bird seeds, animal feed and human food. Seeds collected in the autumn, when ripe are rich in vitamin E with antioxidant properties, and high in polyunsaturates, linoleic acid (needed for maintenance of cell membranes) etc. The seeds can be eaten fresh or roasted and used in salads or bakery products e.g. bread products. As well as looking great in any garden and if you can extract the seeds a great source of notorious food the birds and bees love sunflowers. 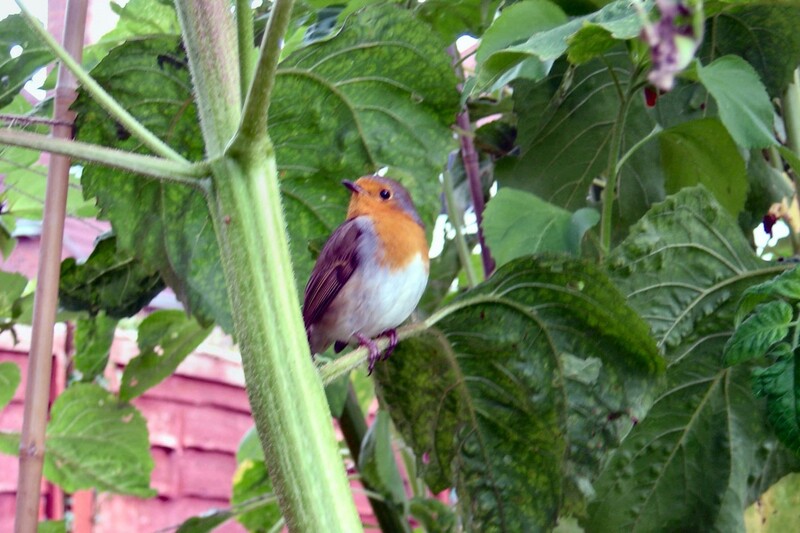 The bees for the nectar and the birds for the seeds; and in the case of our garden a particular favourite for the Robin as a perch when hunting for worms and other tasty insects in the garden; as the photo below shows. Robins being particularly friendly birds will hang around in the garden while you dig in the hope of you turning up a few worms for them, and in exchange are more than happy to pose for you to take their picture. Although I originally introduced cultivated sunflowers from seedlings grown in the greenhouse to the garden and vegetable plot, which can be a trying time as snails and slugs love them until they become well established. Partly combated in my garden by organic gardening and the use of a wildlife pond to maximise the toad, frog and newt population; natural predators of slugs and snails worth encouraging. However, after a few years sunflowers started cultivating themselves naturally from seeds so now I encourage their growth in the vegetable garden as companion plants which work well in the grand scheme of things for my medieval style of gardening. Sunflowers love full sun, some individual plants may need staking during windy periods. The Birds and the Bees love Sunflowers in the Garden. 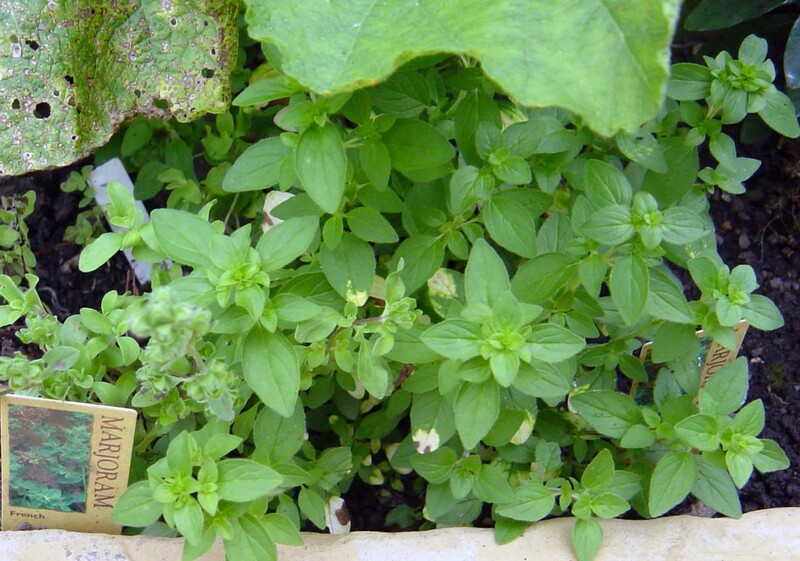 If you have time on your hands why not try your hands at growing and using some of these herbs. Thyme is a hardy evergreen perennial. The varieties of Thyme pictured here grow from about 5 to 10 inches (12 cm to 25 cm) high with a spread of about 18 inches (45 cm). Thyme can be used in cooking and medicinally as a tea makes an excellent remedy for sore throats and hangovers. To make a herb tea pour boiling water onto the leaves and leave for 15 minutes before draining off the resulting liquid and drinking. The heat can be maintained while the leaves are in soak by placing a saucer over the cup. Do not take thyme medicinally when pregnant. The pleasantly aromatic leaves are used as flavouring in savoury meat, soup and stew dishes and are often used as a primary flavour with lamb, tomatoes and eggs. Any well drained soil in full sun, water well and keep moist until established. A brilliant book with lots of good reviews packed with simple instructions and recipes giving detailed information on how to make a wide range of herbal teas, which herbs to use and their benefits. Collecting a small handful (often just a few leaves) of soft leaves from plants that are not toxic (poisonous) to humans e.g. herbs. Placing the leaves in a container e.g. teapot, adding boiling water and covering the pot for a few minutes to allow the flavour and goodness to infuse from the leaves to the water. Straining the leaves and drinking an enjoyable hot refreshing cup of herbal tea. The length to infuse the drink before straining the leaves will be dependent on type of herb used, age of leaf and personal taste. The longer the leaves are left to infuse the stronger the resulting flavour e.g. infuses the leaves for anything from two minutes to 15 minutes. Some herbs, such as Dandelion and feverfew are bitter so optionally (as in medieval times) honey may be added to sweeten the taste. Camomile is another herb that makes an excellent herbal tea but not all varieties of Camomile’s are suitable e.g. the lawn camomile pictured above. 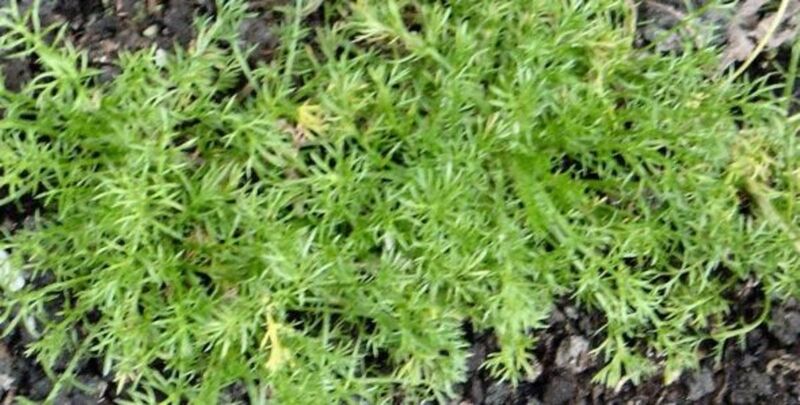 So when buying your camomile plant from the garden centre check beforehand what its properties are and whether it’s suitable for your requirements. Often, in a good garden centre the plant will be well labelled to tell you what it’s culinary and medicinal properties are. It cannot be stressed strongly enough that many herbs have medicinal properties which may react with medicines, be harmful if taken in excess or if pregnant etc. If in doubt seek proper medical advice before using herbs. Herbal recipe book with ingredients and advice to making your own herbal teas; may give remedies to ease common ailments; although herbal remedies should never be used as an alternative to conventional medicine and if you intend using herbs in conjunction with prescribed medication you should seek medical advice first. However, drinking herbal tea in moderation for an occasional drink can be very refreshing. However, if you have the compulsion to pick the young leaves e.g. by wearing gloves and protective clothing to protect yourself from the sting then the stinging nettles have many uses. The process of cooking, crushing or chopping disables the stinging hairs on the nettle's leaves. The nettle is used by many different cultures, and has been used as far back as ancient Greece, for a wide variety of purposes in herbal medicine and cooking. Stinging nettle leaves are high in nutrients, and the leaves can be mixed with other ingredients to create a soup rich in calcium and iron. Historically, nettle soup was a good source of nutrients for people who lacked meat or fruit in their diets. The young leaves are edible and make a very good pot-herb. The nettle's leaves and flowers when dried can also be used to make a herbal tea. However, because stinging nettles often grow in nitrogen-rich ground it often contains high concentrations of nitrates which can be converted in the digestive tract to carcinogenic nitrosamines and therefore should not be used for baby food. 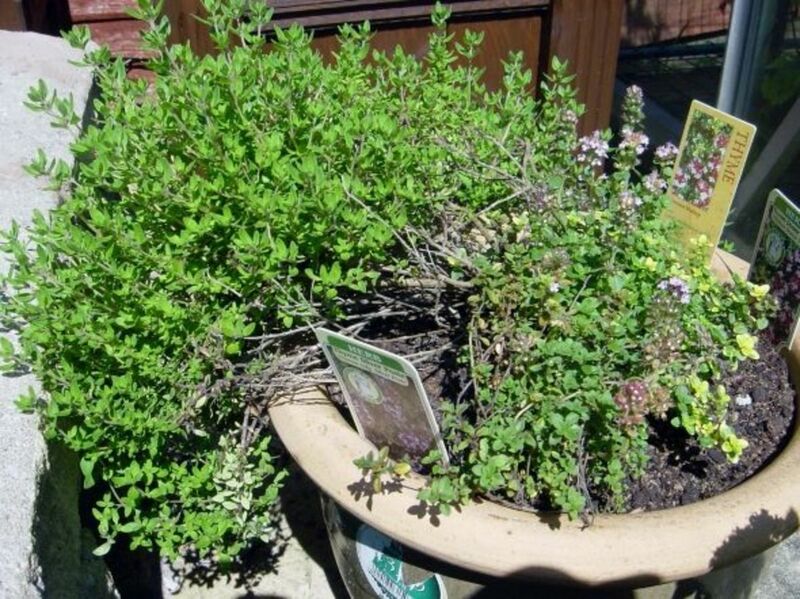 Do you Have the Thyme or Place for a Herb Garden? I do sympathise with you Tommi, sometimes I’ve planted herbs and they haven’t been too happy, so I’ve either moved the location of the pot or replanted them in another container or elsewhere in the garden; sometimes successful, and sometimes not. So I think it may be a case of trial and error, and just keep trying. 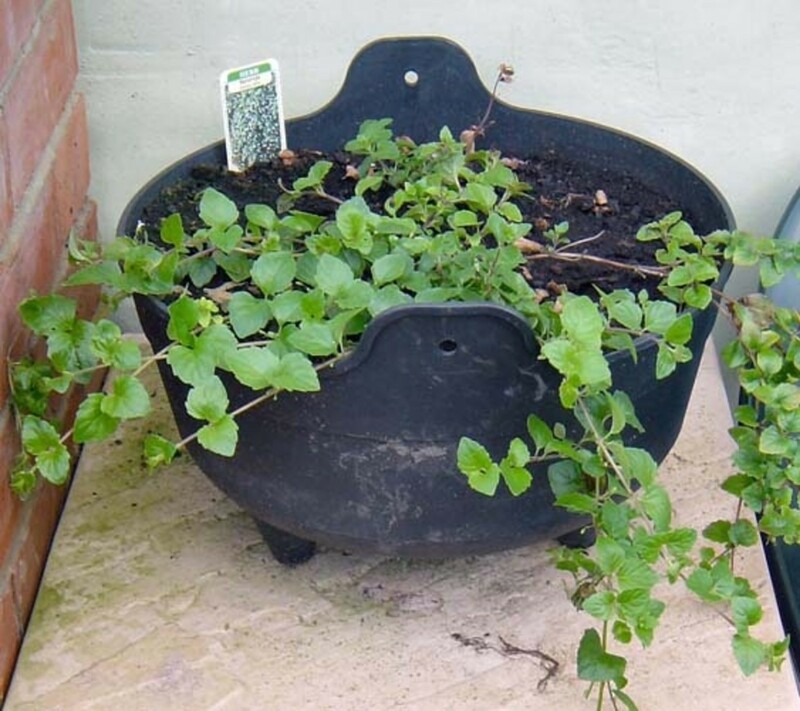 So far the most sustainable and most successful location for my herbs has been in a proper concrete herb wheel at the top of garden; where all the herbs I’ve planted have thrived from year to year. As regards mint, I’ve grown various varieties of mint in pots for years, where some have been reasonably happy and others not. I’ve always grown mint in pots because they spread by their roots and if planted in the ground can spread like a weed. However, a few years ago I built a brick raised bed in the ground, well separated from the rest of the garden so the plants can’t spread, and planted several varieties of mint there. They loved it, and since then a couple of the varieties have become well established; so much so that I can trim them all back hard in the late summer (to promote new growth) and then have fresh mint through most of the winter months, as well as in the summer. I hope I’ve given you some encouragement to keep trying; and wish you all the best. Thanks to all for your comments. My favourite herb at the moment is Borage which self seeds itself in my vegetable garden each year; and the flowers make a great colourful addition to salads. A lot of good information and excellent photos. We are growing several herbs this year in containers...including mint. Learned the hard way awhile back just how invasive it can be. I would love to have a herb garden. The only thing I tried growing was cilantro or coriander. It flourished for a while and then all died. Have not tried my hand at anything after that. Your lens inspired me so maybe I might just do it again. Just getting started in my garden and your lens is inspirational, thanks for compiling. Thanks for a great lens. I am planning to start growing herbs this spring. Thanks for the tips and ideas. Beautiful and inspiring lens. I was thinking about staring an indoor herb garden, so you provided the needed impetus. I love fresh herbs. Enjoyed your pictures! I started growing herbs in my garden - in pots - about a year ago. Now, I wouldn't know what to do without them when I'm making dinner. Nothing like cooking with freshly picked herbs. Glad you added dandelions to the list. They get a bad rap sometimes. Lovely page about herbs. I grow herbs in two raised beds near to our house, except for the mints which i grow in their own pots!! Love the photos- makes me want to get out there herb gardening- except its all snowy here now! Great lens and AWESOME photos! :) I love my herbs, too! I love herbs, both growing them, stroking them so they spread their smell around and using them for cooking. Trouble is, after I plant them, I can never remember what they are and what I should use them for! I am bookmarking your lens for the great information! I grow several herbs in pots on my back porch, but I'd love to grow even more! I can't wait to read more about herb garden. I will be back to see what else you have to say. I have tried my hand at growing herbs with some moderate success. But I don't really have a green thumb so am in awe of people who have beautifully designed and thriving herb gardens. I grow my own herbs and the love picking them right from my own garden while I am cooking. I enjoy pottering in my herb garden. I only have two herbs in my garden. the pandan and ginger. Great lens! Thanks for sharing. 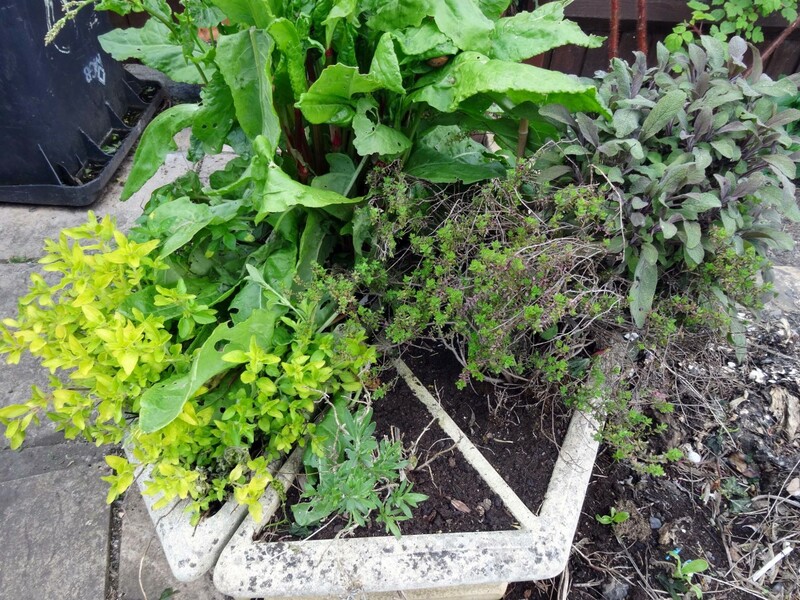 I have a very small herb garden with plants such as lavander, tarragon, melissa, peppermint and rhubarb. 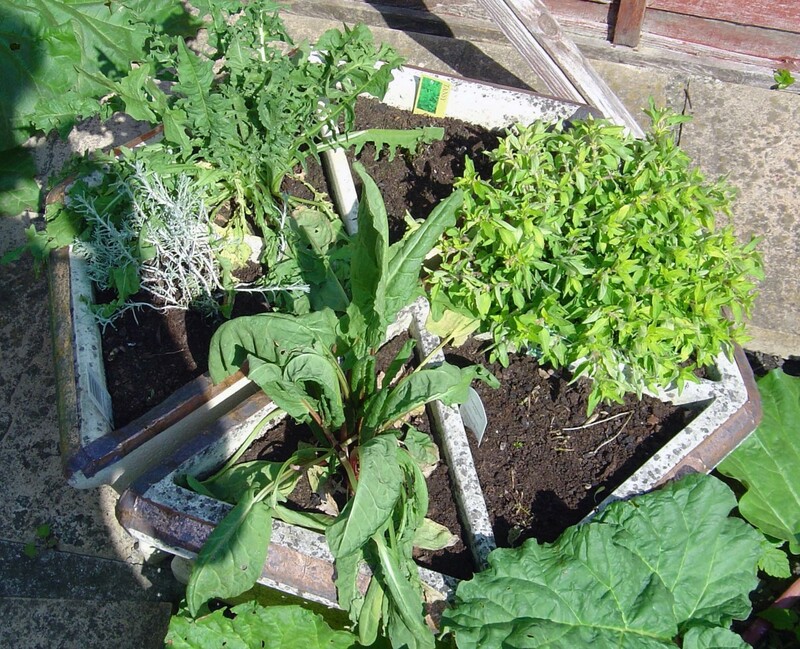 Gardening can be really fun and very interesting for the children. I've been able to visit an herbal clinic in Africa where the nurse there uses many of the herbs listed as well as others to create many different things. Great lens. I'm planning on growing herbs in my garden next spring. Your list will come in handy. I am hoping to have my own herb garden as soon as the temperatures cool down a bit! Blessed! 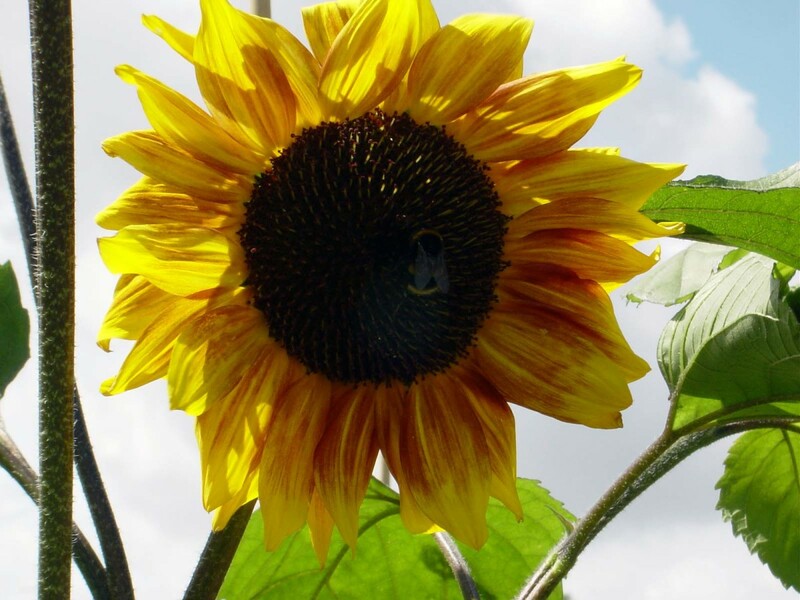 @julieannbrady: Thanks for your comments, I love sunflowers too; perhaps next year when you get an early start in the garden the weather will be more suitable for growing them. I'd love to grow my own herb garden. I just started planting today in my new open space out back. I wanted to do sunflowers, but the heat is too much for them now. Great lens, good info. There are a few herbs here that will likely make their way into our herb garden soon. Hoping to add more to the herbs this year as I study more about using them. I enjoy growing herbs. Even if I don't use some of them much, I love to smell them! I love flowers, herbs and essential oils for cooking and healing. Nice lens. beautifully put together article, enjoyed seeing this. I've wanted to grow herbs for a very long time. Hopefully in the spring . . . I like this lens very much. I have always wanted to use dandelion, but fear residual pesticides in fields that they grow in. We have a large area of natural grass that my husband (he's not on the organic train all the way, yet) sprays a couple times a year. I do have several "organic" beds and a large vegetable garden, though. Also wondering if you ever use "lambs quarter" (sp)? 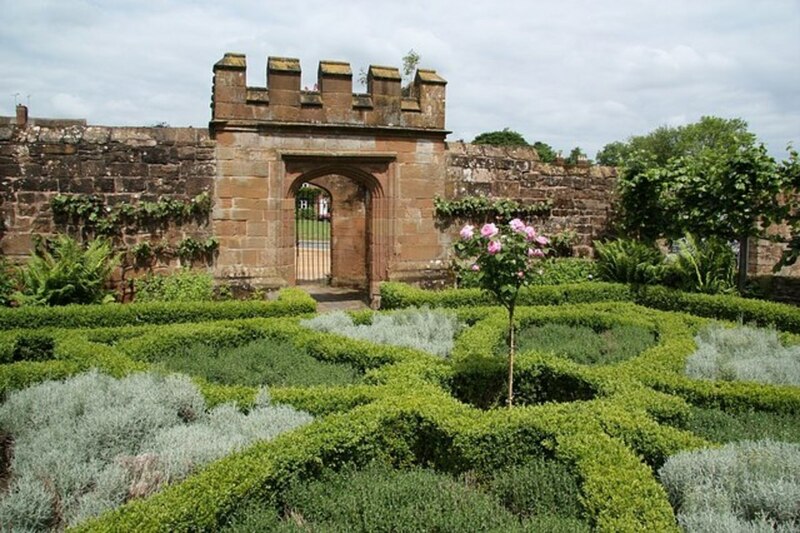 Herbs blend into the garden alongside ornamentals in order to make a harmonious environment. I love cooking with fresh herbs and I will be referring to this lens a lot. Nice lens, I love fresh herbs. Thnks for sharing. @emmajowebster: I love the idea...but may not be able to wait for the flowers. How excellent, I loved my walk through your herb garden...blessed and congratulations on receiving front page honors! we often put borage flowers in our gin and tonics! Nice lens. I just moved and am thinking about starting an herb garden in the spring. But I'm not sure I have enough sun. I always used to grow herbs. Great topic! I love reading about different herbs. I have grown herbs in the past, but not these days :) You really need to keep up on them! Blessed! Seems wonderful to have a herb garden. Right now I have to make do with some basil on the windowsill. 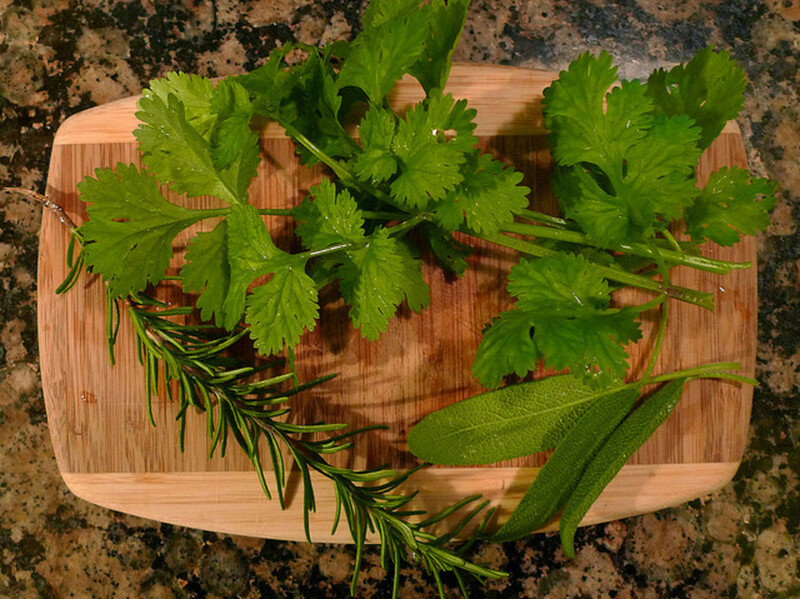 I use fresh herbs every day! Nice lens! I just love it! It really caught my interest! I have mine too so you can kindly check it out! Patio Herb Garden. Thanks! Love the use of the diphthong in 'mediaeval' - tradition is not dead - bully for you! A lovely introduction to some common herbs. Added to "Another 100 Lenses for my 200th Lens"
Cool lens! Thanks for all the tips and recipes. [in reply to whitemoss] Lovage is one herb we haven't tried in the garden yet although we are always experimenting. Great lens! I've just started a herb garden lens- I've got a lot of work to do on it! Do you grow lovage? Its the only herb I have you've not mentioned! Great lens - this all looks delicious! Another splendid lens from you, Sir! My wife grows several herbs in tubs or pots near the kitchen. (She's in charge of that sort of thing - and does it very well.) So I can't really vote for any of the offered options! Cute cat! Good info and kudos on the warnings. 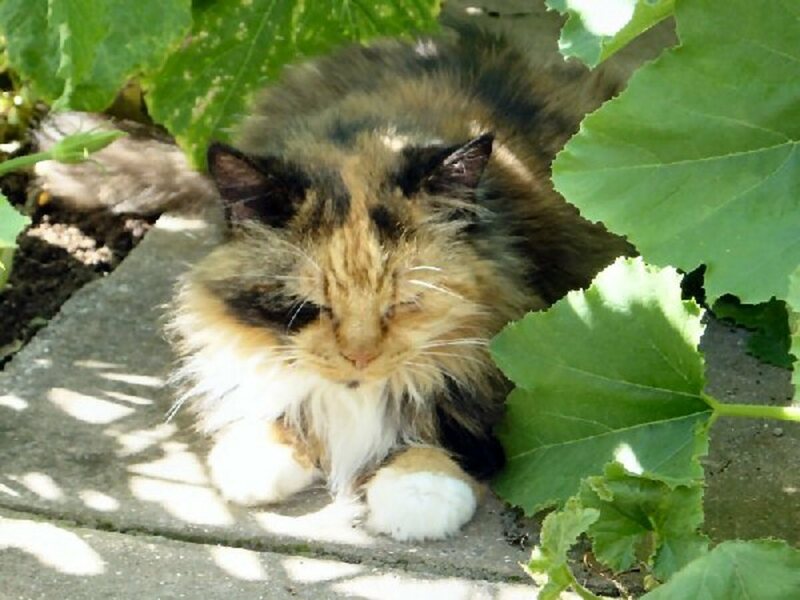 If I find a dandelion plant in the garden, I transplant it to a special bed. It never gets the chance to seed, the flowers get picked for wine. 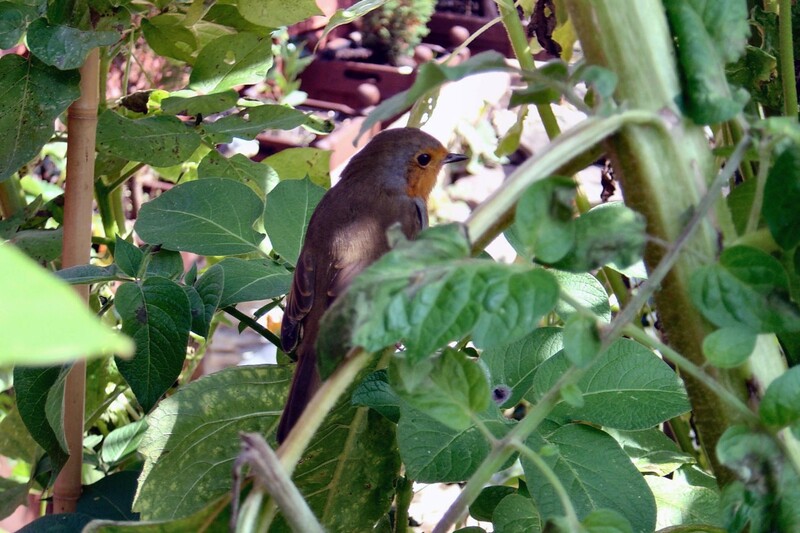 You have created a great lens - I have featured it on http://www.squidoo.com/organic-food-gardening. Great lens. Rated it 5 stars. Feel free to visit betterhealth Care. I have at least a dozen herb plants growing in my garden every year. Many of these are in pots which I can move into the kitchen when the weather gets too cold. Thanks for the review. 5 star lens. Very, very nice. Wow. What a fantastic lens! Thanks for leaving a comment on my cake lens! I would love to have a kitchen garden right outside my back door like my grandmother had. The vegitable garden was past the orchard but her herbs were close at hand. They went from the garden straight into the pot. Here I am again checking out this wonderful lens! I love gardens and animals! Lots of herby goodness! 5 stars. Just wish I had something larger than a NYC balcony. Good info on herbs. Nice picture. I often wondered about "nettle soup"(having come from English ancestors), but I was afraid to ask lest I be served some! Thanks for the info. Good lens with more info. on herbs. 5 star. Thank you for stopping by my lens Live Streaming Video. You have a great lens too with lots of good info. 5 Stars from me! Very nice lens on herbs. Very thorough. Another great lens. Welcome again! !